A windbreaker with its stowable hood outside. A windbreaker or a windcheater is a thin coat designed to resist wind chill and light rain, a lighter version of a jacket. It is usually of light construction, and these days characteristically made of some type of synthetic material. They often incorporate elastic waistbands or armbands and zipper to allow it to be accommodated to the current weather conditions. Regular jackets, coats, and etc. may include a type of windbreaker as an interlining that can be removed when desired. Windbreakers sometimes include a hood, that may be removable. Many windbreakers may also include large pockets on the inside or the outside which allows belongings to be covered from weather such as light wind or rain as mentioned above. Windbreakers are primarily worn in warmer seasons, when wind or rain are expected, or as part of a layering strategy during colder seasons. Brightly colored windbreakers may also be worn by runners as protection from the elements, and as a reflective garment used for safety. Windbreakers offer light to moderate insulating protection, more so than a sweater, but less than an overcoat. The term “windbreaker”, used primarily in North America and Japan, is probably in the process of becoming a genericized trademark, but it is still registered with the U.S. Trademark Office. It was first used by the John Rissman company of Chicago for its gabardine jackets. The term "windcheater” is used in the United Kingdom and certain Commonwealth countries, including Australia and India. It also refers to any glossy synthetic material used to make clothing. 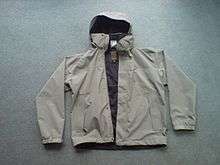 Windcheater tops are also commonly known as cagoules or "wind jammers" in the United Kingdom. However, the term "windcheater" precedes the term "windbreaker" and was originally used to describe a sort of garment that was more akin to a pull-over anorak than a modern windbreaker. Unlike windbreakers, which are waist-length, windcheaters tend to extend up to the thighs and lack quilting or net linings. The term "windpants" (also known as "splash pants" or "overtrousers") describes pants made out of synthetic material with an elastic around the waist. They are usually light and serve to shield the wearer from wind, and sometimes also mud and water. Windpants are almost always made out of polyester or nylon. They are also sometimes worn as an outside layer on top of other clothing, and often have zippers on each ankle so that they can be pulled over footwear. Some windpants have zippers that run the full length of the leg so the pants can be simply unzipped entirely. A 2012 study demonstrated that adding windbreaker pants and jackets offers a lightweight, but effective means of delaying hypothermia if the user is outside walking and encounters unexpected low temperatures. The term 'windcheater' is also used to describe a retail item used on the beach and camping to prevent wind from disturbing social enjoyment. Normally made from cotton, nylon, canvas and recycled sails, windbreaks tend to have three or more panels, held in place with poles that slide into pockets sewn into the panel. The poles are then hammered into the ground and a windbreak is formed.